Hi - I'm hoping someone can help me or provide info on this. 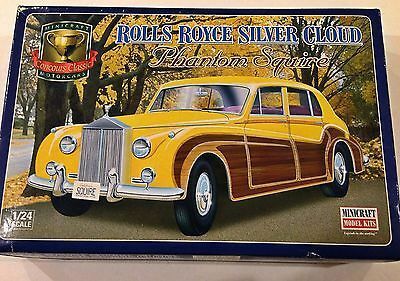 I'm looking for a 1:24 or 1:25 scale 1956 Rolls Royce. Been looking with no success yet. Or maybe a close enough year that I could modify. Thanks in advance & happy modeling!!! Hello Greg. There have been surprisingly few RR model kits offered in 1/25 or 1/24 scale. Luckily, the one post-war kit that has been available over the years is a Silver Cloud kit. The Silver Cloud was in production from '55 - '66, so hopefully this is close enough to what you are looking for. Beware, though, that this is a very simple kit. It has one piece chassis and the engine is a single piece plate with crudely molded details. All parts, including the body, are molded in very thick plastic. However, the body seems quite accurate and a nice shelf model can be made from the kit with a bit of effort. I have no idea which company created the tooling for this kit, but is has been released by several kit makers over the years, including Minicraft, Entex, Revell, and maybe others. I don't know when the kit was last in production but they are generally plentiful in ebay for reasonable prices. If you pick up one of these kits, the one thing to look out for is whether or not the kit has chrome parts. I built the Revell branded kit in the '80s and the parts that would be chrome were just molded in metallic grey. On some versions of this kit these parts are chromed, so shoot for one of those. Hi - Thanks a million for your reply. Gives me somewhere to start. Thanks again & have a great one!!! Hi - I do have that model. Thank you for your reply. I was curious if there were any other RR model kits of that year. Thanks again.